Many cities host “beer weeks” — Denver, Seattle, Portland, Boston, San Diego and San Francisco to name a few… Here at HooDoo, we are excited to announce our involvement in Alaska Beer Week, 10 days designated to celebrate delicious craft beer. Alaska Beer Week runs Friday January 10 through Sunday, January 19, 2014. During Alaska Beer Week, Fairbanks beer drinkers can expect events that will entice their senses. HooDoo has events scheduled to expand Fairbanks’ craft beer culture through education, collaboration, cooperation, and responsible libation. 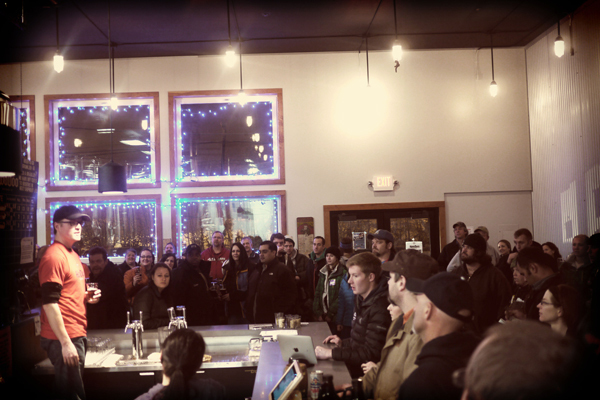 The crowd waits for the Barleywine 2013 to be tapped during AK Beer Week last January. This year will feature taproom events like Cupcakes and beer pairing with local A&K Cupcakes, a Tex-Mex, beer-infused menu by Lane’s Quickie Tacos, tappings of HooDoo’s new Barleywine, 2013 Barleywine and Belgian Saison, Brewhouse tours, brew appreciation classes and daily drawings. 6pm: #akbeerweek photo competition kickoff. Here’s the deal! 1) post your Alaska-Beer-Week-themed photos to our facebook page, or to your twitter or instagram account, 2) be sure to tag #HooDooBrew or @HooDooBrew AND #akbeerweek, 3) enter as many times as you want! So go ahead, take that awesome beer selfie, a pic of your beer buddies in the taproom or an artsy HooDoo pint photo. Get creative. We’ll choose daily winners for HooDoo swag. One grand photo guru will be chosen on Monday, Jan 20 and we’ll shout your name from the snowy peaks of Alaska, praising your name (and we’ll send you a grand swag bag full of goodness). 12pm: New Release – The much anticipated HooDoo Barleywine 2014 will be tapped. Barleywine 2014 is our interpretation of a classic English Barleywine; the strongest of all the English Ales and a showcase of intense malt flavor and complexity. 11am – 7pm – Golddigger Dogs gourmet hot dogs available in the Taproom. These delicious dogs, made from Alaskan Grown beef, pork, buffalo, elk, and caribou, pair excellent with any HooDoo beer. 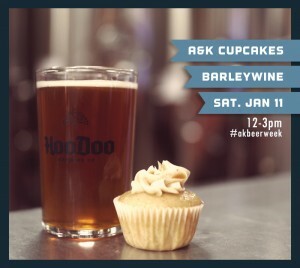 One of the most popular events, our beer-inspired cupcake pairing with A&K Cupcakes. 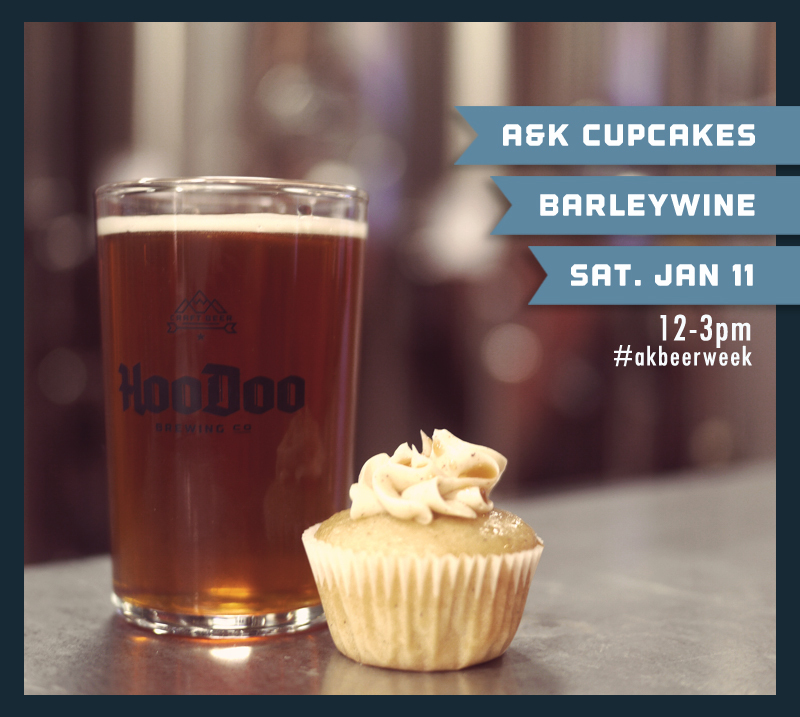 12pm – 3pm: Local confectioner A&K Cupcakes will create an assortment of beer-inspired mini-cupcakes to pair with your Barleywine. That’s right, Cupcakes & Beer go hand-in-hand! 1:30pm – Brewmaster’s Class: Mind Your Malts. About the class: Barleywines are one of the biggest beers brewed, and also one of the most rewarding for the brewer. One of the major challenges for the style is the production of a high gravity wort, loaded with sugars the yeast can ferment into the warming alcohol Barleywines are known for. Learn why the base malt and the malts that are layered into the brew play a key roll to the success of making Barleywine, and many other styles. $20, includes a beer for class and a take-home pint glass. Limit 15 people. Reservation recommended by calling 459-BEER or by signing up in the taproom. 4pm – Brewery Tour. See how it’s made during a tour of HooDoo. Brewmaster Bobby will lead a group of up to 15 people. Reservation recommended by calling 459-BEER or by signing up in the taproom. Free. 3pm – Beer Release // HooDoo Barleywine 2013 – If you missed the lusciousness of our 2013 Barleywine, here’s your chance to be hugged by its velvety goodness. Only a 1/2bbl (one full keg) will be tapped. No growler fills, but a Barleywine flight will be available, 4oz flight for $6 or an 8oz flight for $10. 5:30pm – Beer Release // Belgian Saison – Seasonal release HooDoo Saison, A traditional farmhouse ale, complex in style but easy to drink, will be tapped to the delight of its fans. Fruity and spicy in aroma and flavor, with yummy earthy yeast tones and a dry, tart finish. 6:30pm: Brewmaster’s Class: Belgians and Barleywines. It’s no secret that brewmaster Bobby has an affinity for Belgian, German and English-style brews. The focus is on Barleywines and Belgian styles for this class – what makes them unique, and a review the flavors and method behind high-alcohol brewing. $20, includes a beer for class and a take-home pint glass. Limit 15 people. Reservation recommended by calling 459-BEER or by signing up in the taproom. 11am: Taproom Tacos – AK Beer Week Style – Hometown favorite Lane’s Quickie Tacos will be back in the taproom with a beer-infused twist on his delicious tex-mex faire. 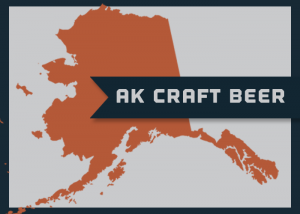 Come close out AK Beer Week with lunch at your local brewery! 4pm – Brewery Tour. See how it’s made during a tour of HooDoo. Quality Control Manager Paul will lead a group of up to 15 people. Reservation recommended by calling 459-BEER or by signing up in the taproom. Free.